The Policy papers were written in the winter of 1992/93 and submitted to the White House in early 1993. I never heard back from the Clinton Administration directly. But that wasn’t necessarily a bad thing. I had been asked by an administration insider (or so he described himself), to produce a policy paper on drugs and crime and I had done it. I now had policy papers (as written proposals) on Drug Courts and related issues focused on the national level. Writing and rewriting the papers helped clarify those issues in my own mind and focus on national priorities for the first time. [Coincidentally or not, the Policy Papers were mostly adopted over the next eight years]. The papers had another important benefit. They established me as someone who had connections in the White House (which were dubious at best) and as someone who had actually thought through policies on a national level. I took those policy papers to conferences and presentations for distribution. They were an important calling card, giving my words substance and even a kind of gravitas at a critical juncture in my career, when I was particularly susceptible to the Siren Call of Washington. With a casual suggestion in 1992 that I write Policy Papers for the Clinton Administration, my attention had shifted from local and state issues, to focus on a national mission; developing a National Policy for Drug Courts. I had been bitten and the fever would soon follow. Back on planet earth, the snow was still falling; I was isolated, with no phone (no cell phone), or other means of communication. I found my barren apartment (not even a chair to sit on), turned on the heat and, thankfully, found that it was working. I opened my baggage for the first time to unpack my belongings. No heavy clothes, gloves, sweaters. Mostly muscle shirts, shorts, floppies and such. Apparently I had grabbed the wrong bag when leaving Oakland. The Condo manager advised that I shouldn’t expect any deliveries or mail for at least a week and maybe two (The D.C. area and Alexandria in particular were not well prepared for even minimal snowfall). That first night I slept on the floor next to the heat ducts, with Hawaiian shirts draped over me. It would be two weeks before I would have rental furniture delivered and almost as long for my personal effects to arrive. The next day I walked the two blocks to NADCP, located at Community Anti-Drug Coalitions of America, better known as CADCA (NADCP at that time consisted of myself and my Chief of Staff, Mark Pearce, and two cubicles at CADCA). The federal government had shut down because of snow, and I was the only one there. I enjoyed the quiet and the opportunity to begin to organize myself, so that we could move forward when the snow permitted. It was during this slow time, with CADCA offices closed, that I received my first official phone call. It was from Jose Cerda, a White House aide, and friend, welcoming me to D.C. After exchanging pleasantries, he invited me to be a panelist on a Juvenile and Crime Panel to be hosted by the President at a Maryland high school. An auspicious beginning for NADCP after all. I met Jose Cerda one cold winter’s day in 1993. I was a recently elected Oakland Judge, with outsized ambitions and energy. It was March 10th and I had just presented a statement to the President’s Commission on Model State Drug Laws, then sitting in Philadelphia, PA. I was planning my return to Oakland when I spoke to my wife from the Philadelphia Airport. I hadn’t heard back from the White House regarding my policy papers (see above); my alleged connection to the President had never really come through. I asked her what she thought of my going to D.C. and trying to make contact on my own. It were bitterly cold and there were snow flurries and promises of a storm on the way, so it was questionable whether anyone would be home at the White House. It sounded crazy, even to me, but she encouraged me to do it. I called a number I had been given for the Criminal Justice Section of the Domestic Policy Council. I expected to be routed through office personnel or reach an answering machine or service. Instead a youngish, studious sounding man answered the phone. His name was Jose Cerda and I was to learn that he comprised the Criminal Justice Section of the White House Domestic Policy Council: gun control, community policing, drug abuse; he pretty much handled it all. He had a cold, sounded stuffy, but had work to do at the office (which at the time did not have an answering machine). I explained who I was and tried to make myself as impressive a personage as possible. He seemed oblivious to my titles, but invited me down to D.C anyway to visit with him. I was to meet him at the Old Executive Office Building, which sits next to the White House. I flew to D.C., checked into the Tabard Inn, which became my home away from home during the early Clinton Administration. At the Old Executive Office Building the next day, I was screened and checked I suppose against FBI files. After about fifteen minutes I was given my badge. I found myself wandering the wide green hallways of this distinguished relic (completed in 1888). I found Jose’s room on the second floor and Jose behind an enormous wooden desk covered with papers, publications, legislation and other stuff. Jose was always hard at work; dedicated, bright and responsible. Until he got that phone answering machine sometime in 1995, he was reachable at his desk on most days. Jose gave me a warm welcome. He was about 5’8”, slight of build, with glasses, and tended to be a bit distracted at times. He was aware of and fascinated by the drug court concept. I was fascinated that a 27-year old had been put in charge of criminal justice affairs at the White House. Jose was well aware that treatment-based Drug Courts had started in Miami, during Attorney General Janet Reno’s tenure as District Attorney. But he was also very interested in my ideas, writings, and plans for drug courts. I left Jose the Clinton policy papers and other documents I had written on drug courts. After our meeting, I felt I had made a friend at the White House. 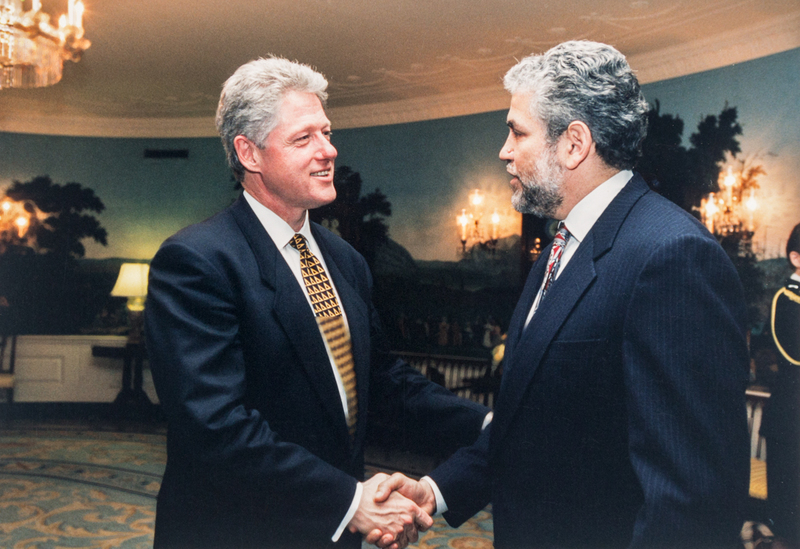 I stayed close to Jose throughout the Clinton Administration. He would turn to me for advice and assistance, as I would to him. I enjoyed the time we spent together socially. He introduced me to some fine D.C. restaurants (my first fifty dollar shot of Brandy). I was almost twice his age but didn’t feel it. There was one point at dinner at a Spanish restaurant near DuPont Circle, when I asked him his age. He gave a reply that I still find endearing and revealing at the same time He said he was 27 but would soon be 28. Over the next six years he became an ardent supporter of drug courts, which helped me to establish both the credibility of the drug court field and my credentials within the field. The first request I received from Jose was in 1993 and concerned the “Violent Crime Control and Law Enforcement Act” (hereafter, the 94’ Crime Act), then before Congress. It was an Omnibus Bill, the longest and most comprehensive criminal justice legislation ever. One of its least known provisions was a “Drug Court” section. Even Jose wasn’t sure what was in the Drug Court Section, but suggested I get in touch with the Senate Judiciary Committee and find out. Surprised at the inclusion of drug court in the ’94 Crime Bill, I recognized this as an important opportunity. The ’94 Crime Act was landmark legislation, the first major legislative to come out of the Clinton Administration (after its Health Care Debacle). Jose wanted me to organize drug court judges and other supporters across the country to lobby Congress to pass the bill. I met with the Senate Judiciary Committee’s Counsel, who provided me with a copy of the Bill (at that time, Senator Joe Biden chaired the Committee). Title V, Part 5 of the ’94 Crime Act was entitled “Drug Court”. There was a billion dollar authorization in the “Drug Court” Section of the Bill (for years 1995-2000); covering criminal justice reform, prison programs, and other projects, but no mention of “Drug Courts”, except in the Section title. I shared my disappointment with Jose. He asked me if I would work with him, the Senate Judiciary Committee, and the Justice Department and provide their legislative staffs with the information needed to make the drug court section of the 1994 Act applicable to drug courts. I of course jumped at the chance. At that time, I was ignorant about the legislative process, I worried how we could spend that kind of money on a nascent program; I was to quickly learn that only those projects receiving appropriations, were funded, no matter what was in the authorizing legislation (i.e., Drug Courts were authorized for $29 Million in 1995/96 and received an appropriation of approximately $7 million). I took my assignment from Jose regarding the ’94 Act seriously. This was a major opportunity for Drug Court Practitioners to prove themselves politically effective. So I consulted with those with lobbying experience in D.C.: District Attorney Claire McCaskill of Kansas City, MO (now Senator McCaskill); Nelson Cooney, Vice-President at CADCA; Jay Carver (then director of D.C. Pre-Trial Services); and Jose himself. I began to make contacts with judges and others who might have relationships with members of Congress, especially connections to Judiciary or Appropriations Committee members. I drew up lists of drug court judges and other interested parties who were from states with congresspersons on critical committees. I wrote fact sheets that provided our judges with the information they needed on drug courts and the ’94 Act and asked them to come to D.C. (which they often did at their own expense) and meet with their legislators (sometimes I would set up the actual meetings). It worked far better than I had anticipated. I stayed on the phone for approximately six months, contacting judges and other drug court supporters, encouraging them to lobby for the drug court provision in the crime bill. In doing so, I became something of a de facto leader of an activist drug court judge coalition. I took to calling our loosely organized group something like the “Coalition of Drug Court Judges” or simply the “Judges’ Coalition”. In the end, I was given to understand, the coalition’s lobbying efforts in support of the crime bill and its drug court provisions had been extremely effective. Among our coalition leaders in 1993/94 were Judges Joel Bennett (Austin), Sue Bolton (Phoenix), Bob Fogan (Fort Lauderdale), Richard Geblein (Wilmington), Michael Getty (Chicago), Stanley Goldstein (Miami), Harl Haas (Portland), Eugene Hamilton (D.C.), Jack Lehman (Las Vegas), Steven Manley (San Jose), Steven Marcus (Los Angeles), Bill Meyer (Denver), John Parnham (Pensacola), Bill Schma (Kalamazoo), John Schwartz (Rochester), Ronald Taylor (St. Joseph), Henry Weber (Louisville), Jamie Weitzman (Baltimore) and Bob Zimien (Boston). Also District Attorneys Claire McCaskill (Kansas City) and Bill Ritter (Denver), Public Defender Michael Judge (Los Angeles County), Pre-Trial Services Director Jay Carver (D.C.), and Program Coordinator, Tim Murray (Miami) …and many others, unfortunately lost to memory. The judges who were able to attend the ceremony were (I believe), Richard Geblein (Wilmington), Bob Fogan (Fort Lauderdale), Michael Getty (Chicago), Harl Haas (Portland), Eugene Hamilton (D.C.), Jack Lehman (Las Vegas), John Parnham (Pensacola), Bill Schma (Kalamazoo), John Schwartz (Rochester), Jamie Weitzman (Baltimore), and District Attorney Claire McCaskill (Kansas City). The Presidential Pen and a framed copy of the “Violent Crime Control and Law Enforcement Act of 1994” is prominently displayed in my home. More importantly, I was pleased that our coalition had done so well at its first opportunity to lobby the Congress. It was a display of drug court power and credibility that impressed everyone, including myself. I realized that reliance on local practitioners (especially judges and D.A.s) and their promotion as regional stars was should be at the very core of who we were. There were few training dollars and relatively little expertise for Drug Courts around the nation, but there was a growing group of effective drug courts (many with politically connected judges) that were developing a sense of comradeship and a philosophy of mutual assistance. [Back to the snows of January]…Once the snowstorm had abated, my Chief of Staff, Mark Pearce, and I began putting together our strategic plan for the year. A high priority for the organization was interaction with the White House, the Department of Justice, and Congress. We presented at, or were part of, a number of White House events, appeared at hearings on Drug Court related matters, and met with government officials, congressional members, and their staffs interested in the potential of the drug court. I often was contacted by Jose or other government official before 8AM and asked to appear at a hearing or meeting by 10. As I lived two blocks from CADCA offices in Alexandria, I could be in my Sunday best at a congressional hearing within an hour. My job was to show the flag and establish NADCP to the Washington Elite as a vibrant, aggressive, and credible community-based and judge-centric organization that stood at the center of the drug court world. At one White House gathering soon after I opened shop at NADCP, I was introduced to General Barry McCaffrey, then the new Director of the Office of National Drug Control Policy (ONDCP). He was a straight talker and told me right off that he wasn’t convinced about the effectiveness of drug courts, but that he was open to persuasion. I told him that that was more than fair; we only wanted to make sure he had relevant information and an opportunity to visit drug courts to make up his own mind. He said that was exactly what he would do. I moved around the Second Floor Gallery, looking for anyone who might be of help to the new organization. I approached these gatherings with real trepidation. Mixing with the political elite was still difficult for me, but I put on my best smile and approached Donna Shalala, Secretary of Health and Human Services. I introduced myself as Judge and President of the National Association of Drug Court Professionals and expressed an interest in talking to her about drug courts. She looked at me as if I had two heads and kept on walking. I remember taking in the rejection, and moving on to new potential contacts. As has been written by many before, these “get-togethers” were mostly about meeting and greeting those who could advance your career, organization, or agenda. When you would see someone looking over your shoulder, you knew your time was up and that the person you were talking to was about to move on. It happened all the time.